For all your British boxing needs. The wait is finally over; the highly anticipated fight between bitter rivals James DeGale and George Groves will finally go ahead following the British Boxing Board of controls’ decision to pencil in the clash for an April 9th date. However it is highly unlikely that the bout will take place then and it is highly likely that Hayemaker Promotions and Frank Warren Promotions will request the fight be pushed back. The British Boxing Board of control did confirm that the fight between the two will be for the British Super-Middleweight title and would take place at London’s Olympia. With the fight now officially confirmed, fans will be licking their lips in anticipation of a fight that has been on the cards since the pairs amateur days, where Groves picked up a unanimous decision win. There has been plenty of bad blood between the two, with neither missing the opportunity to verbally bash each other in the media and dismissing the others boxing ability and with DeGale in action this Saturday night; you can bet he is going to want to send a message to his future opponent. One thing is for sure; the build up and fight itself promises to be an explosive event. You can view the very first encounter between the two by clicking Part 1 Part 2 Part 3 Part 4. Watch below to see what James DeGale had to say about George Groves following his win over Paul Smith last December. DeGale, whose next opponent is strongly rumoured to be long time rival George Groves, has not boxed since beating Paul Smith to win the British title last December. The British super-middleweight champion will take on the 34-year-old Kobal, who has won only seven of his previous 21 professional fights (five by way of KO) and has failed to win in his last five fights. 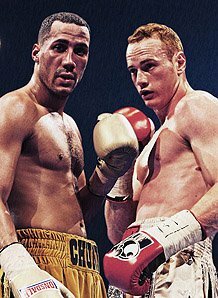 With George Groves impressive in his win just last week, DeGale will be looking to impress and send a message to his bitter rival as talks of a fight between the two Londoners hot up. Boxing chat on the fastest growing sports forum. Create. Comment. Debate. 606v2. Are we witnessing the demise of Frank Warren Promotions? All comments will be moderated. I retain the right to delete comments of an unsuitable nature. This blog conforms to the Wordpress content policy.